"Everything Which You Do Not Forgive Yourself or Another For, Will be Repeated in Your Experience, Until You Do Forgive." These MP3's should properly be called "Rev. 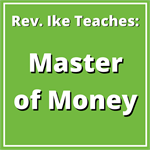 Ike's Forgiveness Series" -- and they contain the most important lesson you may ever learn! Rev. 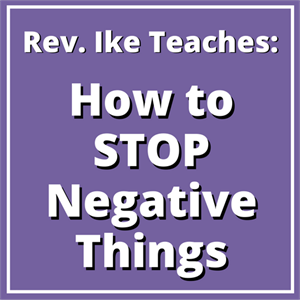 Ike teaches that harboring feelings of anger, resentment, or guilt, actually draws MORE negative experiences to you. Whenever you find that you are continually drawing people into your life that hurt you in some way, it is very possibly because you are carrying either hurtred or hatred -- and you are not forgiving. For the sake of your OWN health and happiness, you must forgive others -- and you must forgive YOURSELF first! Because failure to forgive yourself for some mistake, or wrongdoing, results in a guilt complex and self-persecution. And a guilt complex demands and draws punishment! 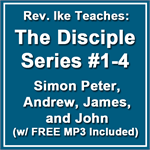 In this life-changing teaching series on 2 MP3 files, you will repeat with Rev. Ike, powerful affirmation treatments that will reach down deep into your subconscious mind and cleanse your soul of the anger and resentment against others that has been a festering sore for so long. You will let go of guilty feelings, and stop persecuting yourself -- you will learn how to accept God's forgiveness. You won't be the same person after listening to this workshop and practicing forgiveness! A burden will be lifted from you! You will finally be free of the hurts and anger that have kept you from peace of mind and from the blessings that you richly deserve. Total length: 1 hour 17 minutes. Most influential teaching in my life! This has been one of Rev. Ike's most influential teachings in my life. After listening to it I realized how I was allowing long-standing hurts and resentments to interfere with my happiness and peace of mind. I practiced his forgiveness affirmations, with feeling, and what a difference it made in my life! This is one of Rev. Ike's best and most important teachings. Everyone should own it.